Virtua AP protective eyewear offers sleek, unisex styling, lightweight comfort and exceptional value. It is designed with high wrap polycarbonate lenses, integral side shields and brow protection to provide a comfortable fit and ultimate protection. Clear anti fog lens is made of polycarbonate lens and absorbs 99.9 percent ultraviolet light. Recommended applications include chipping, chiseling, drilling, grinding, machining, masonry, pouringcasting, power fastening, riveting, sanding and sawing. 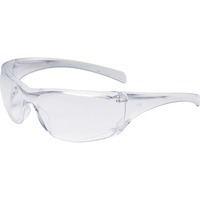 Safety glasses meet the requirements of CSA Z94.3 2007 and the High Impact Requirements of ANSI Z87.1 2003.